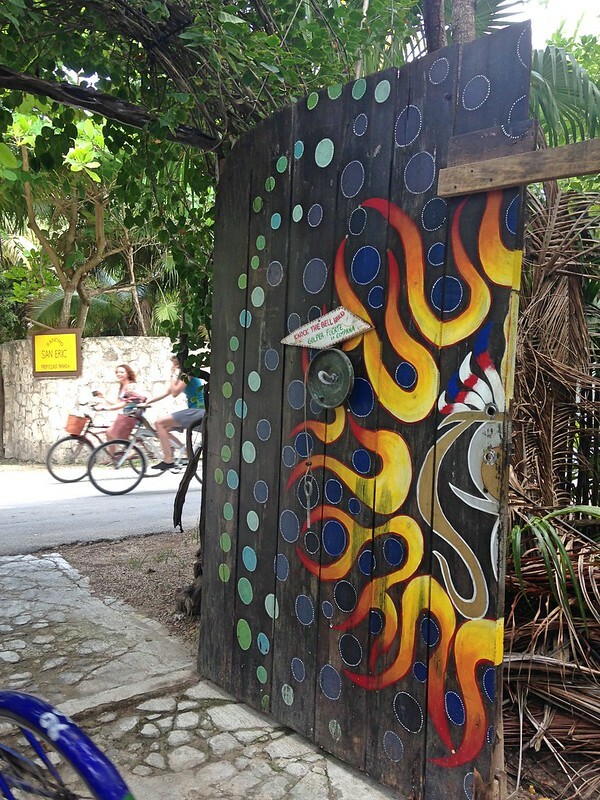 Tulum is a quirky mix of New-Age wellness, Mayan revivalism, Mexican-American fusion, and … Canadians. It’s not your “typical” anything, but it is a very special place. 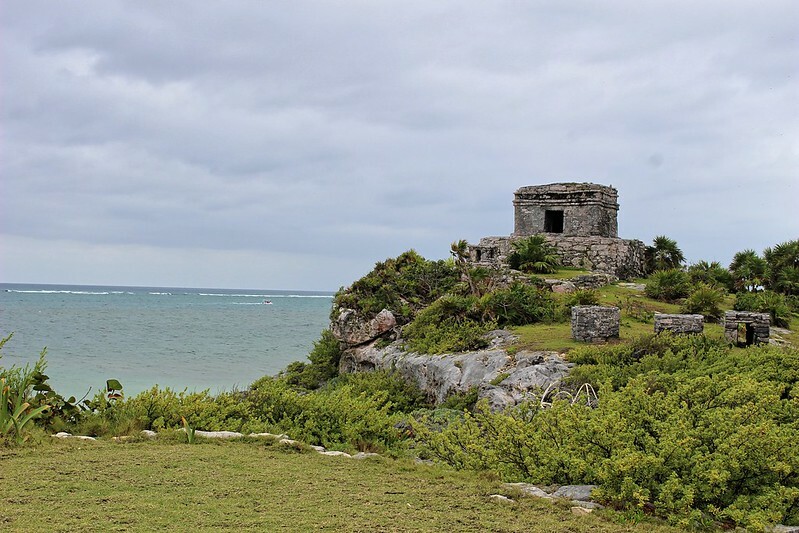 First, some geography: Tulum town is nestled about 4 miles inland from the beach, which makes for quite a hike from the hostels and budget hotels. Most mid-range travelers opt instead for accommodations along “the beach road,” a treacherous 6-mile stretch of growling water trucks, zippy cabs, squeaky bikes, and brave pedestrians. In reality, there’s no such place as the Eco 360 Jungle Lodge. Instead, there’s a “private” set of cabanas behind a fusion restaurant called Mamasan. We chose “Eco 360” based on photos that made it seem like our cabana would be tucked back in the jungle and out of the nightlife fray, but in fact, we were right next to a boisterous sushi bar, which isn’t awesome when your walls are made of glass and rattan. We were tempted to be disappointed, but the Mamasan staff (who moonlight as the “hotel” managers) totally killed us with kindness and over-the-top hospitality. We’re rooting for the Mamasan folks, just as we’re hoping that the sushi place gets demolished by a jaguar. But of course, you don’t go to the Yucatán to hang out in a hotel room. 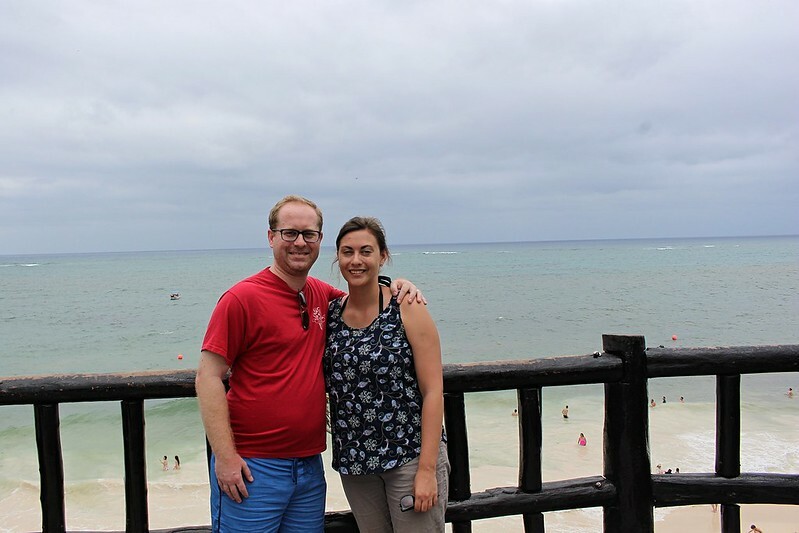 Our first full day in Tulum, we scurried into position for our primary mission: the beach. Pro tip: Pony up and buy the American sunscreen that costs four times as much as the Mexican sunscreen that “must be just as good, right?” Trust me, it’s not. On Tuesday, we woke up to clouds and a bit of a breeze, which made it the perfect day to hop in a cab and cruise over to the Tulum ruins. 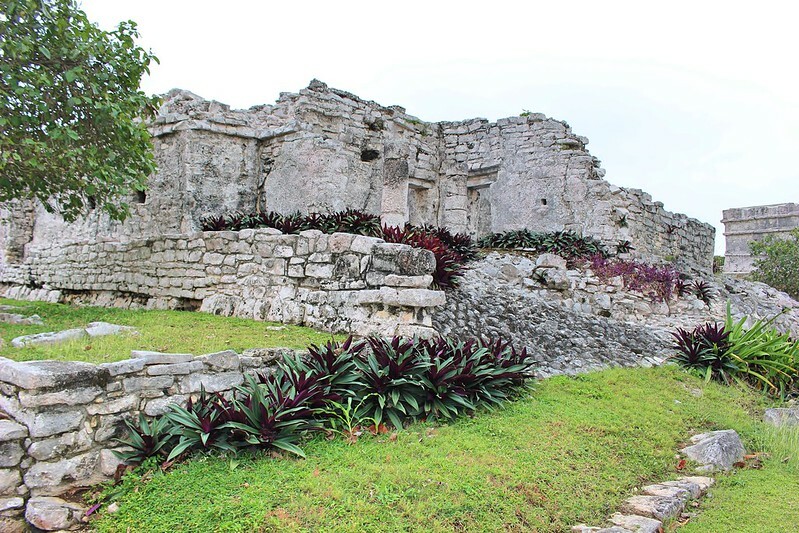 In the late 1200s, Zamá (the original name for Tulum) was the only Mayan city on the coast, and it was a trading port for jade, turquoise, obsidian, and other pretty stuff. The Temple of the Wind God, who was definitely in charge of the universe the day we visited. Part of the wall protecting the castle. If you look really, really closely, you’ll see the iguanas tucked amongst the bricks. And, of course, the BEST part of the ruins is the beach! Swimming with an ancient temple as a backdrop is well worth the crowd. The ruins technically have two public beaches, but one was closed for nesting sea turtles, which is a worthy cause in my book. 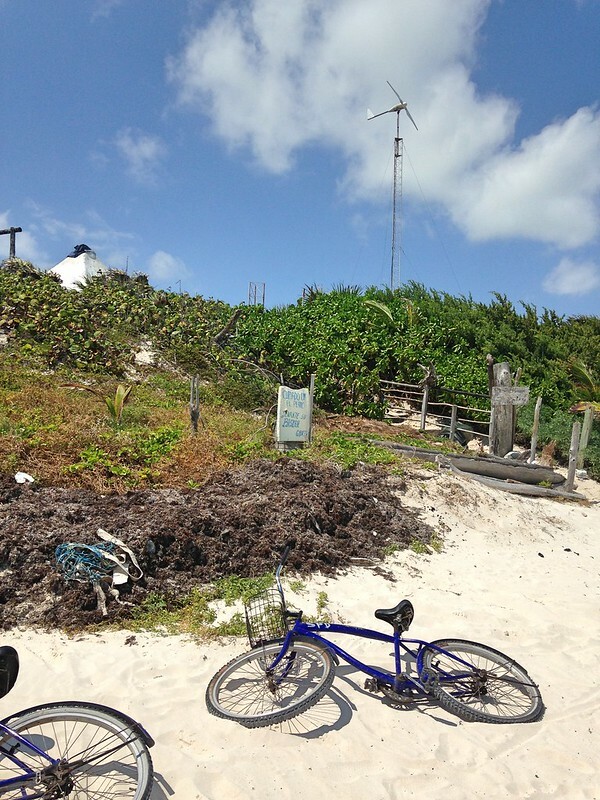 Renting bikes is a must-do in spread-out Tulum. But Matt and I got a little, ahem, ambitious once we got ours. 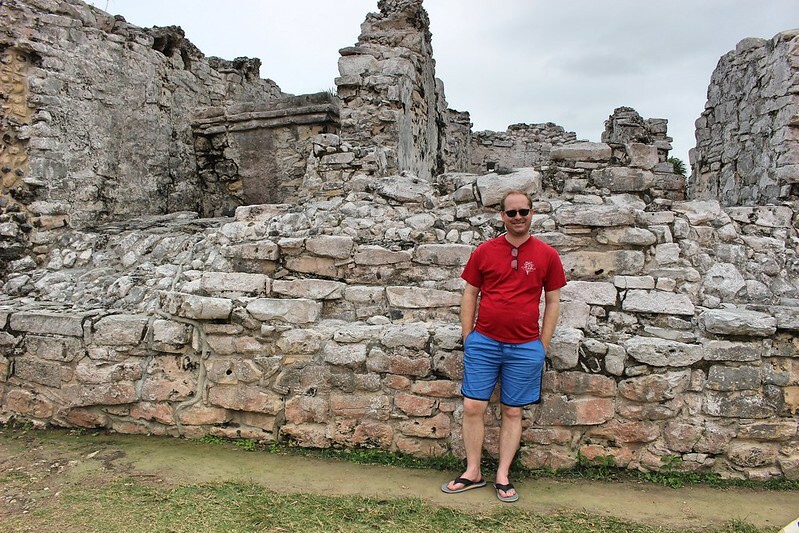 We biked to the entrance of Sian Ka’an, a biosphere that protects two big lakes, a swath of jungle, and a Mayan bridge that dates back 1,000 years. However, a few miles past the gate, it became clear that we weren’t prepared for an all-day quest in humid heat with only one water bottle for the two of us. So, of course, we stopped at the beach. The sign says Beware of Dog, and the steps lead to a row of “eco” lodges. Because even the biosphere isn’t immune to development. Unfortunately, a massive patch of seaweed floated up as we were sitting, and we decided that the biosphere beach wasn’t such a great swimming spot after all. A couple of nudists also helped our decision to move along. So we backtracked to the park gate and stopped for vegan tacos at a place called Charly’s. And hand to God, THIS WAS MATT’S IDEA! But hey, soy chorizo ain’t half bad. After refueling with plant products, we spotted the entrance to a hippie campground. 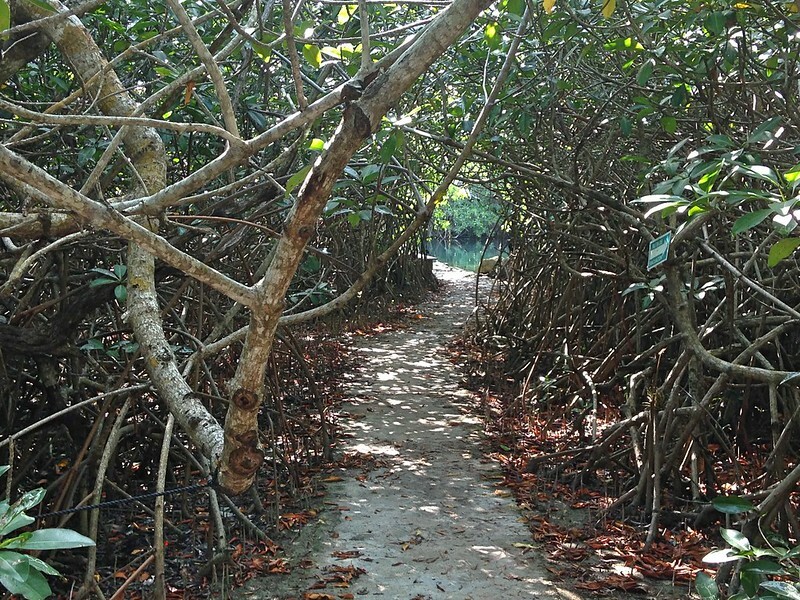 After relieving us of 100 pesos and having us take showers to clean off the sand and salt, the campground folk showed us to a mangrove trail that led to Cenote Encantado. 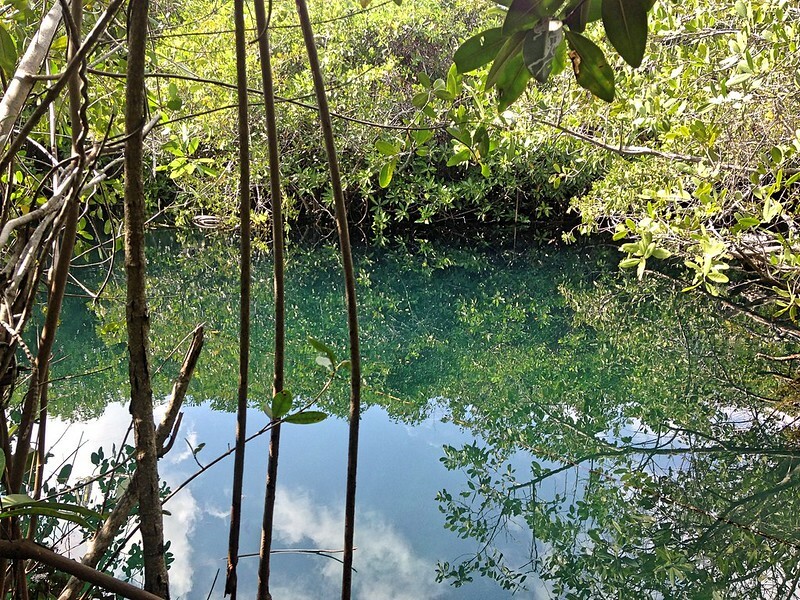 A cenote is a well of fresh water that bubbles up from an aquifer; most of the Tulum cenotes are based in caves, but Encantado is more like a tiny, pristine lake. This is just the entrance area; around the bend to the right, the cenote opens up into a clear, calm oval, and if you look down, you can see the jagged rocks that the water comes up through. Along the edges of the water are small structures for “water ceremonies.” And back in the campground, we found a homemade temazcal, or Mayan sweat lodge. 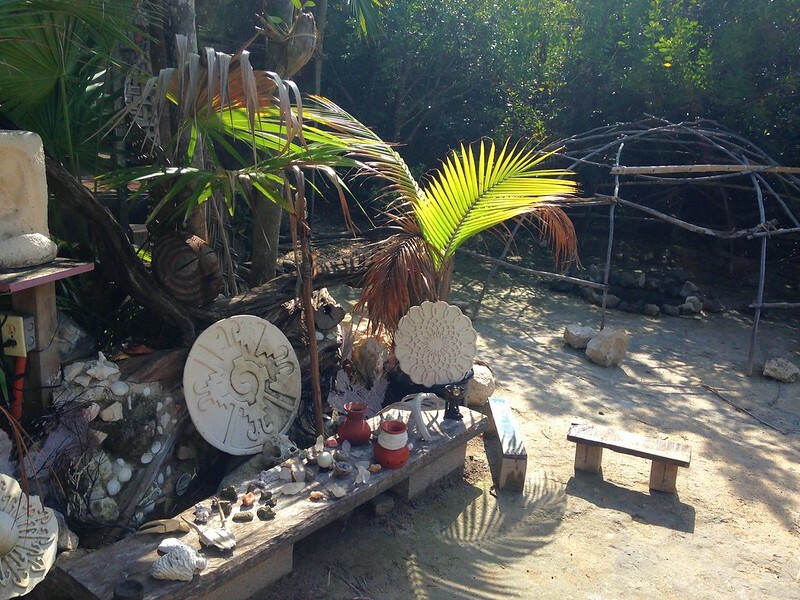 Pay-to-pray temazcals are popular at the wellness spas in Tulum. Sweat lodges are not for everyone, and it would be very easy to end up in an unsafe situation if you’re not careful. I think it’s worth questioning whether this intense, two-hour ceremony should be commercialized to the general public at all, but if you’re gonna do it, make sure you’re doing it with people who will take care of you in the dark steam. A mezcal Old Fashioned at MurMur. Tulum has its critics, and if you’re a knee-jerk zealot for “authenticity,” you’ll be one of them. 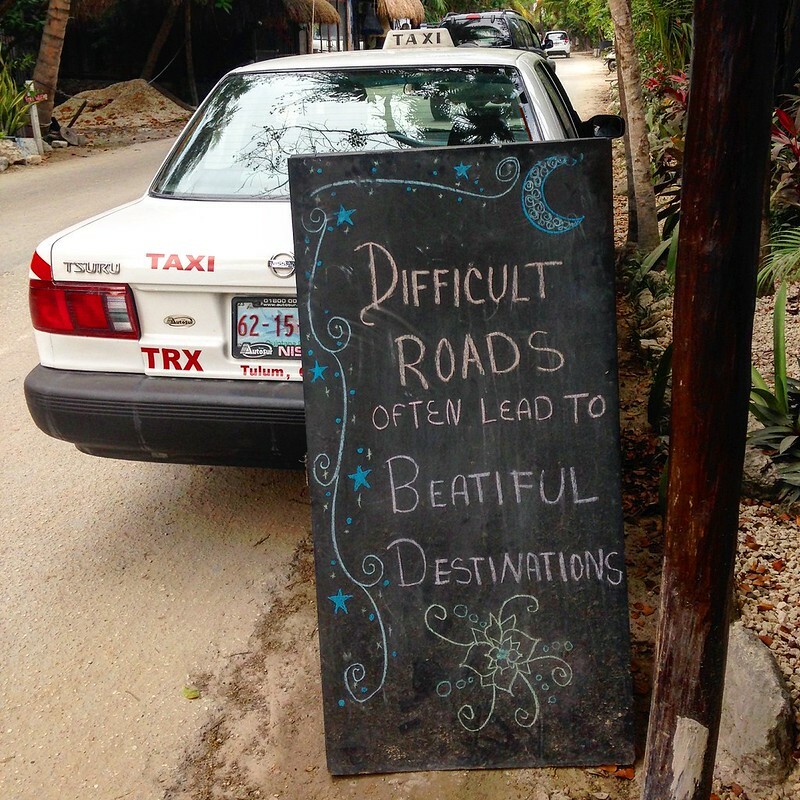 But the beauty of Tulum is its complicated dynamism. 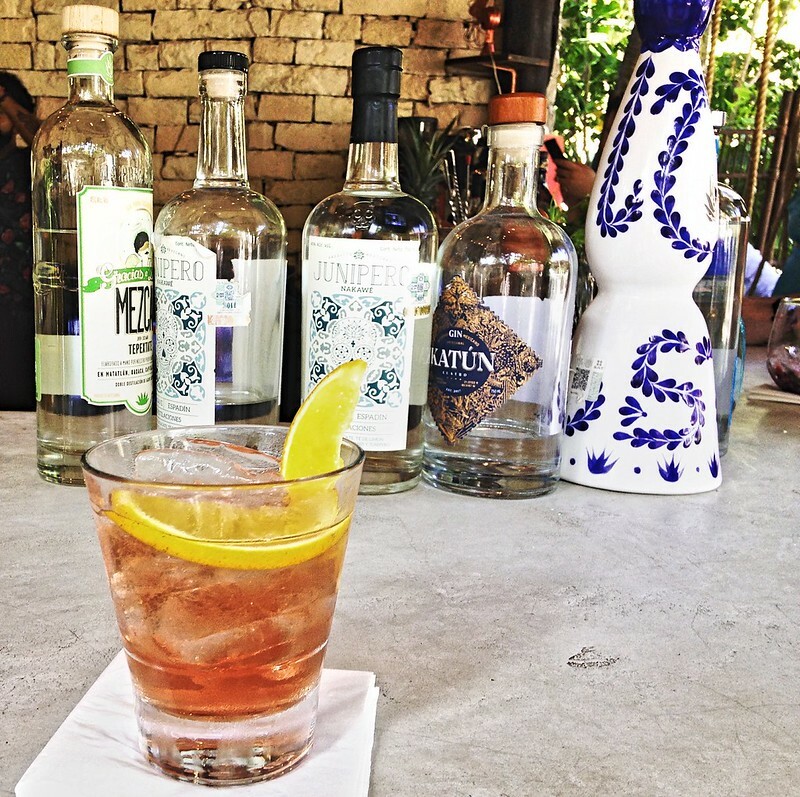 It’s Austin-In-The-Jungle, with a Mexican twist. 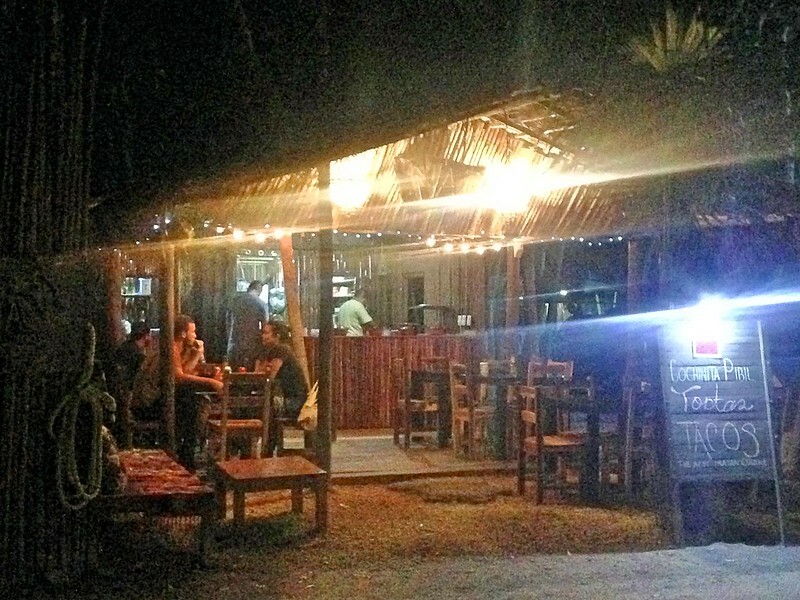 Fruit juice with wheatgrass shots, American cocktails adapted to mezcal, vegan tacos — the food is the most obvious expression of Tulum’s fusion culture. We found one of the most interesting examples of this in an “authentic” looking shack. This restaurant doesn’t have a name, but the sign outside says All You Need is Cochinita Pibil. You can’t tell in my crappy photo, but the shack is located across the street from a busy cluster of bars and an ice cream shop. We were drawn to it because it appeared to be the only place along the beach road selling “real” Mexican food. Cochinita pibil is a slow-roasted pulled pork dish that’s flavored with citrus and cooked in banana leaves, and if you slather it in haberno sauce like I did, it’s the most flavorful ball of fire you’ll ever eat. We loved it so much we ate here twice, making it the only restaurant we repeated during our week in Tulum. On our second visit, Matt got chatting with the owner, a young chef who happens to be from … Houston. The owner identifies as Mexican, but he has deep American roots and spent time studying food in Italy before settling in Tulum. He hiked into the jungle to learn Mayan recipes, including cochinita pibil, and he plans to expand his restaurant and build a traditional roasting pit that tourists can watch from the road. His place represents the sort of outsider/insider, traditional/modern tension that’s at the fundamental core of Tulum’s rapid development. Is this place an “authentic” Mexican restaurant? 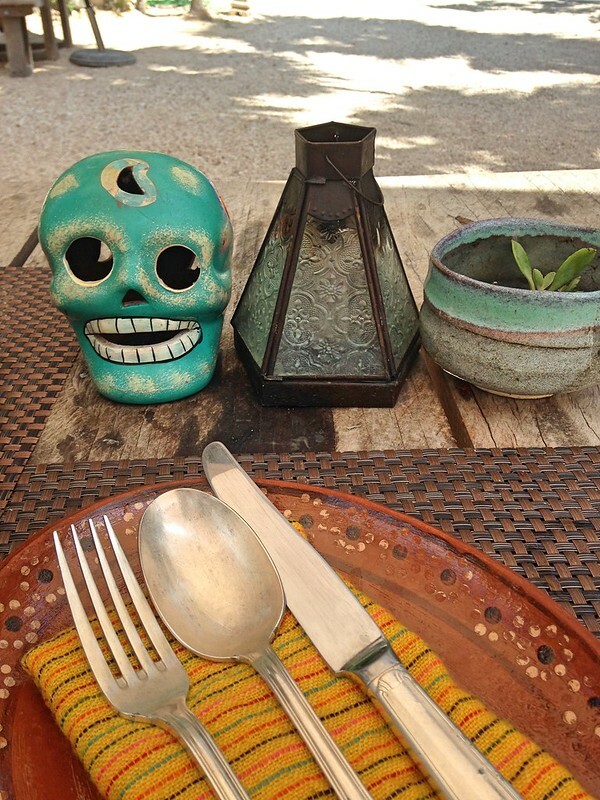 Is it selling “authentic” Mayan fare? Does it matter? 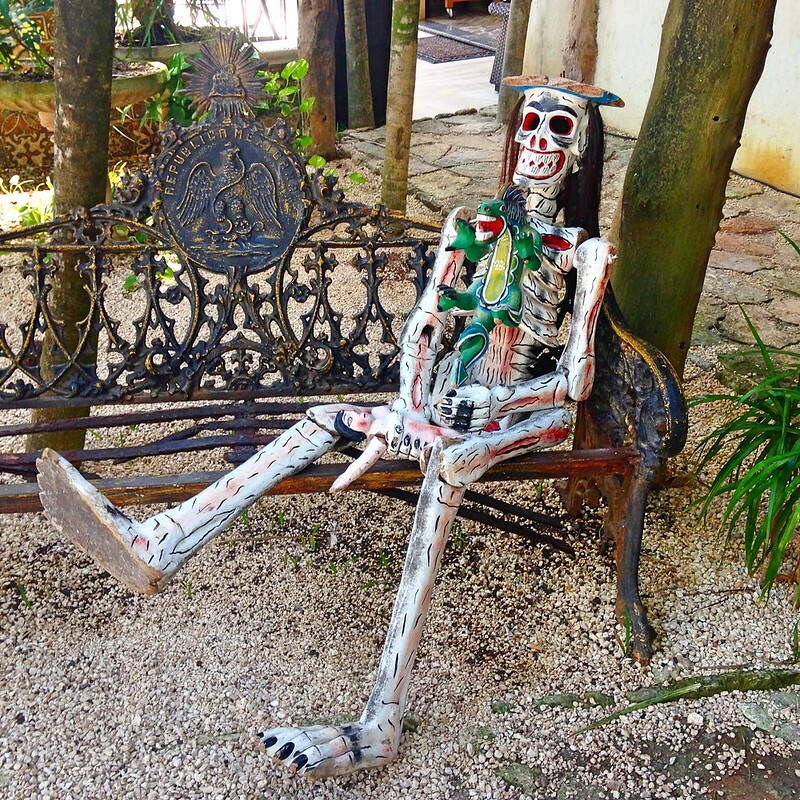 Food isn’t the only element of Tulum that prompts these sorts of questions. Ubiquitous along the beach road in hotels and restaurants and shops are Mayan dreamcatchers, which are hoops with intricately woven thread, turkey feathers, and seashells. 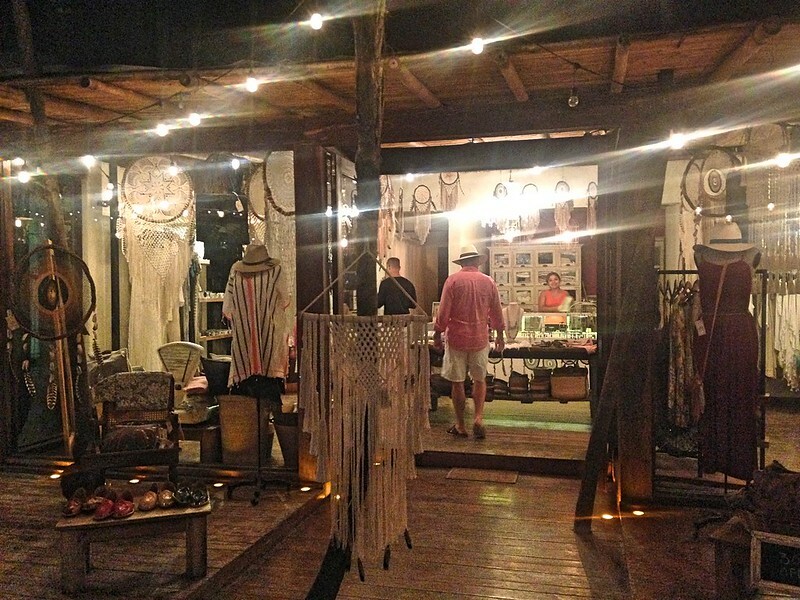 Bendito’s is an adorable boutique that’s featured on several fancy fashion websites. It sells incredible dreamcatchers, the smallest of which go for $50 U.S. dollars. And yes, I bought one! If you watch this odd New York Times video, you’ll hear the maker say that Tulum dreamcatchers are made from “local materials,” and it’s this emphasis on natural elements that makes them a uniquely Mayan craft — a claim that holds no water at all if you’re familiar with the Ojibwe. And many of the dreamcatcher patterns I saw around Tulum are very obviously modeled on North American pan-Indian dreamcatcher designs. So what’s the deal? Syncretism. It’s a beautiful thing. 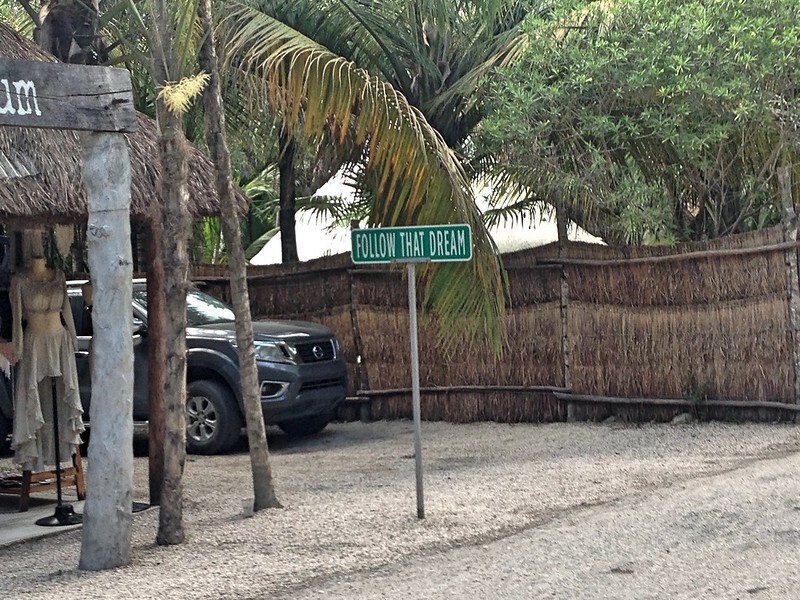 The beach road is peppered with inspirational signs (in English) that emphasize wellness, healing, and finding your happiness; Tulum is literally trying to lead the way toward harmony. It’s not a perfect place, but nowhere is. Yes, a lot of foreigners own the businesses here. But most of the folks working in those businesses are from Quintana Roo. And yes, everything “spiritual” has a hefty price tag. 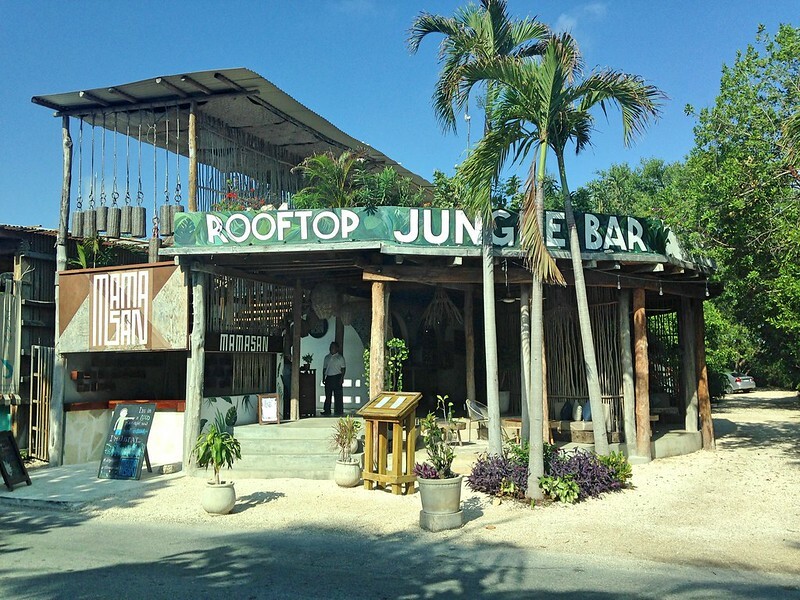 But Tulum is at least talking about sustainable construction and development, and there’s an entrepreneurial spirit here that still feels accessible and innovative in a way that a lot of beach resort towns do not. 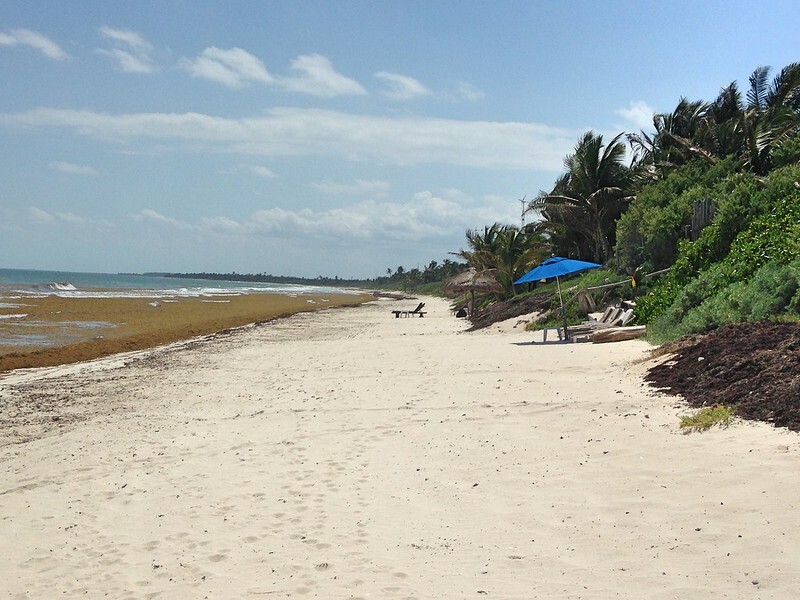 In short, Tulum is a fascinating case study in tourism and place-making. But above all, it’s simply a great beach. P.S. The locals are super smiley!